The Monteverde International Standard Size Cartridge is designed to fit most fountain pens. The cartridge comes with the world's latest ink treatment developed for better ink-flow quality. The ITF™ ink treatment used in this cartridge extends cap-off time while lowering ink drying time on the paper. It also lubricates the pen feeding systems and protects from corrosion and clogging. Choose from a wide range of ink colors! 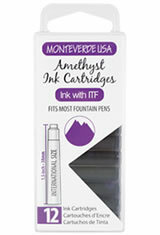 Buy your Monteverde International Standard Size Cartridge today. The Monteverde International Standard Size Cartridge(12pk) Fountain Pen Ink usually ships within 1 business day unless otherwise specified. Each Monteverde International Standard Size Cartridge(12pk) Fountain Pen Ink we sell is guaranteed to be genuine, authentic and will arrive brand new & unused! Great ink that flows really well in a great cartridge set. I used it with a Kaweco Sport fine and they work great and have a nice color. The ink(and the color) in these cartridges are really top-notch. Very luxurious flow and drys very quickly. I had been using a converter that came with my Monteverde and some off brand ink. But that combo never allowed the pen to perform correctly--I always had some skipping. But this issue was solved when I ordered these Monteverde cartridges, and they work as well in my Sheaffer pens too. Excellent ink, and very handy when working in the field, as they take almost no room in the pocket. The last time I bought ink cartridges for a fountain pen was in 1989. I found them at a University book store. I had no luck finding anything related to fountain pens at any retail store in 2018. I went on line and thankfully found these at Pen Chalet. I had to do something "high tech" to do something "low tech"! I received these but they did not fit my fountain pen. The length of the cartridge was right but the connection (hole) was too small. I can't seem to find the right cartridge size for my pen. This ink runs a bit wet in the Jinhao 301 I am using it in. It feathers a bit on cheap paper, but not too bad. I love the color and the international cartridges work well. Their ink is always fantastic and cartridges are well made. The packaging is very nice and lends itself to taking it places. The packaging can be used for future traveling with different cartridges. The plastic shell keeps them in place and protects from damage. Are these 1 1/2" cartridges? The Monteverde International cartridges are in fact 1-1/2" in length. Will this refill work in my Kaweco ART Sport? The Kaweco pens will accept any standard universal ink cartridges or converters so yes the Monteverde International Standard Size Cartridge will fit your pen. will this refill work in a monteverde one touch stylus inkball pen? Yes this is the correct ink for Monteverde one touch stylus inkball tool pen.